The inaugural Forum on Food Security and Nutrition, hosted by Canadian Feed The Children in New Brunswick in November 2014, brought together grassroots participants in food security including health professionals, teachers, community leaders, cooks, and project coordinators from Ontario and New Brunswick, as well as food security networks and other food-focused organizations. Through seminars and workshops, participants shared the practical ways they address food security in their schools and communities. “I found it exciting and energizing to have such a diversity of people in the room working on school food initiatives, from Elders to students to health professionals. It was especially amazing to witness the knowledge-sharing and learning across community school cooks, students, local foodies, and leaders,” said Mueni Udeozor, CFTC’s Program Officer. During the event, teachers and school principals learned how to start and maintain small gardens, and how to prepare healthy meal plans on a budget. Technical experts shared practical ways to strengthen programming, and many of the teachers and principals expressed a willingness to incorporate new ideas into their student nutrition programming. Participants learned how to strengthen existing student nutrition programming and forged new partnerships and new ways of working. “There is momentum on this issue across the country and bringing people together to share in this way creates space, not only for learning, but for greater coordination, collaboration and innovation. The event was truly a success in every way,” said Mueni. Student involvement in nutrition education is key to Eel Ground’s school food program success. 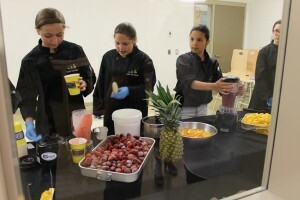 Here, students prepare smoothies at a community held in June 2015. 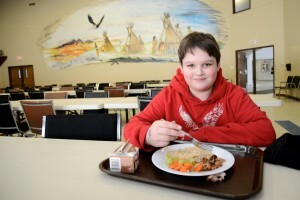 For the past five years, Canadian Feed The Children has worked with the community of Eel Ground First Nation to improve the nutrition of their school breakfast and hot lunch program, which has had a tremendous impact on the students and broader community. CFTC recently had the opportunity to hear about the challenges the community continues to face, and what members of the community think of the school nutrition program. Chief George Ginnish has lived in Eel Ground First Nation most of his life, and has been Chief since 1996. “I live with a great group of people. I love working here, and am glad to be part of a team that is working together to move our community forward,” he said during a recent interview. “First Nations, we have many challenges, and poverty is one of them. Seven of the ten poorest postal codes in Canada are in New Brunswick First Nation communities, so it’s really important for us to find partners [like Canadian Feed The Children] that will work with us,” said Chief Ginnish. Eel Ground now has raised beds and a new greenhouse, thanks to CFTC donor support and ongoing learnings within and between communities. “It’s a reality that a number of our community members have to rely on the food bank,” said Chief Ginnish. “These days it seems like everyone is in a rush; everyone needs to get somewhere, they need to pay bills, and they only have so much set aside for the food. So some kids will only eat once a day and for us that’s really heartbreaking,” said Gail Hanafan who has lived in Eel Ground her entire life and is on the band council. Students are taught how to make healthy choices – and healthy food is always available at Eel Ground First Nation, thanks to CFTC donor support. “Years ago we found out that a lot of kids were being bussed home at lunchtime, but they were coming back and a majority of them were not eating. So we set out to start a lunch program here at the school. It wasn’t a very good one. But we were able to get it going, and were eventually able to partner with Canadian Feed The Children,” said Ivan Augustine. Ivan was principal at Eel Ground School for over 18 years, and is now the Director of Education for Elsipogtog First Nation. “Ever since we started working with Canadian Feed The Children we’ve seen a lot of benefits. We started off with meals that were not very nutritious years ago, like hot dogs for example, but now we’ve moved towards nutritious meals with moose meat, salad, vegetables and fruit. 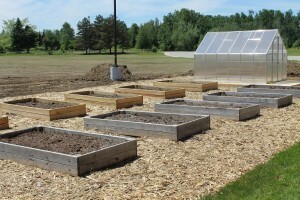 We have a program where kids grow seeds in the classroom and transplant them to the garden,“ Ivan said. Eel Ground School Principal Helen Ward attributes improved attendance and academic achievement to the nutrition program. “We see that in our classrooms, once they’ve eaten and had a well-balanced meal, they’re ready to take on the day. They have energy. They’re alert. We see it in the assessments that we perform on them,” she said. Helen has been principal at the school for the past two years, but has worked for Eel Ground First Nation for 16 years. During her years as a teacher in this community, Helen remembers many situations where it was apparent children were not receiving proper nutrition at home. “We had an incident where a child knew that they were going home and there was no food, so they would search in their classroom and the school to gather stuff to take home so that they could make sure they themselves and their younger siblings would have something in the evening,” she said. 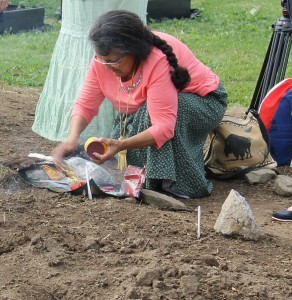 Blessing of the Garden at opening of Elsipogtog First Nation’s 2015 school garden. Prep cook Kim Francis and kitchen staff member Freda Simmon have worked at the school prior to Canadian Feed The Children’s involvement in the breakfast and hot lunch program, and have witnessed the transformation first hand. “I think it’s important because the kids are getting a nutritious meal each day, which some of them may not be getting at home. It helps them focus and attend school more. You notice the kids’ attendance. The ones who never came before, you see them coming every day now, and they’re able to focus,” Kim said. “With the breakfast and hot lunch program, I find the kids happier and more outgoing. Before that you didn’t see much of that. They didn’t even want to come to school,” she said. “We always see a smile on their faces, and they always say ‘Wela’lioq!’, which means ‘thank you’, for their breakfast and hot lunch,” Freda added.